Stephen Sondheim’s legendary musical starring Patti LuPone and Rosalie Craig comes to the West End in 2018. 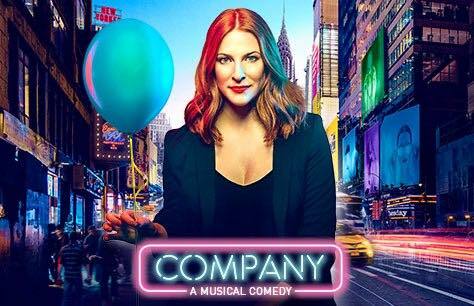 London's Gielgud Theatre presents Company, tickets are available now for this incredible Sondheim classic, with a twist. Don't miss Rosalie Craig and Patti LuPone in this show that promises to take the West End by storm. Stephen Sondheim and George Furth’s convention breaking musical Company has won multiple Tony and Olivier awards. The original show broke the mould at the time eschewing the traditional boy meets girl storyline of musical theatre in favour of telling the story of consummate bachelor and ladies’ man Bobby. In this modern stage adaptation, Stephen Sondheim has given unprecedented permission to recast the main character as a mid-thirties woman, Bobbie, played by Rosalie Craig. At Bobbie’s 35th birthday celebration she can’t get away from the inevitable questions: When are you going to find Mr Right, settle down, have a family? This incredible cast comes to the Cameron Mackintosh's Gielgud Theatre for a strictly limited run from 26 September 2018 to 22 December 2018. Rosalie Craig will be joined on stage by tour de force Patti LuPone, Mel Giedroyc, Richard Fleeshman, George Blagden and Matthew Seadon. Marianne Elliot is set to direct this first offering from Elliott & Harper Productions. This Stephen Sondheim is a fixture of modern musical theatre. He is known as a lyricist and/or composer for such incredible works as West Side Story, Gypsy, Follies, A Little Night Music, Sweeney Todd, and Into the Woods. He has won more Tony awards than any other composer and multiple other awards including Academy, Pulitzer, and Olivier awards in addition to 8 Grammys. Rosalie Craig is an Olivier nominated actress. She is best known for her role in Tori Amos’ The Light Princess. She has performed on the West End in Finding Neverland and Ragtime, among others. Her recent work for the National Theatre has included As You Like It and The Threepenny Opera. Patti LuPone is an American actress, two-time Grammy and Tony award winner as well as an American Theater Hall of Fame inductee. She is known for such classic musicals as Evita, The Cradle Will Rock, Sweeney Todd and Gypsy. Her recent television credits include American Horror Story: Coven, Girls, Penny Dreadful and Crazy Ex-Girlfriend. Company tickets at the West End's Gielgud Theatre are booking now, act quickly to secure your tickets to this limited run!